Unmistakably forged in their home port Munich, Eisbrecher are one of the big flagships of „Neue Deutsche Härte“ (New German Hardness) – a characterful variation of heavy, stoical German speaking music. For 15 years the band has been navigating so far in the shipping channel of this music genre that seems to be like a sculpture to everything that is meant to be typically German. Though, the band is playing and breaking with the genre ´s tight borders. 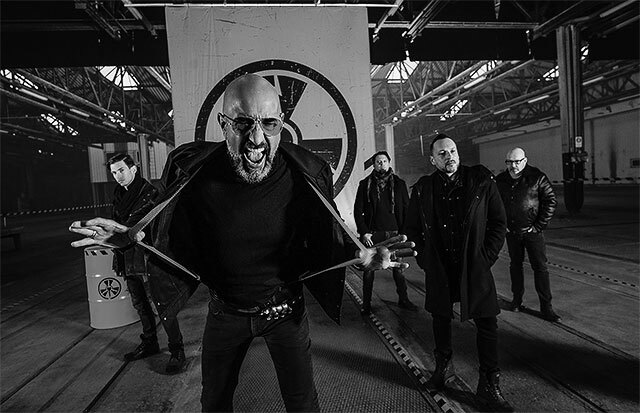 With their German lyrics being intelligent and striking at the same time, as well as their characteristic rhythms, Eisbrecher have established themselves far beyond Germany. Within a few months only the band achieved double gold for their recent two albums „Die Hölle Muss Warten“ and „Schock“. Two times they reached a number two chart entry. In spring 2016 the band did an almost completely sold out tour that lead the musicians also to Russia and Finnland. Their current album „Schock“ stayed in the German charts for 33 weeks. Next to numerous big festivals such as Greenfield, Rockavaria, Rock In Vienna – there the band played in front of 50.000 people before Rammstein –, Summer Breeze or Mera Luna, Eisbrecher have also done a special show on Germany ´s highest mountain Zugspitze, right on top of it. In between all their spectacular liveshows, their stoical heavyness, their machine-like riffs and the intelligent lyrics the band has its very own personality. Play of words is also something the ready witted singer Alex Wesselsky is not only good at when it comes to Eisbrecher, but also when it comes to TV shows. He hosted several shows on German TV such as „Der Checker“ (DMAX), „Auto gebraucht“ (Kabel1), „Auftrag Auto“ (Sport1), „Fort Boyard“ (Kabel1) or „Red Bull Crashed Ice“ (Kabel1). The Augsburg born musician is shooting for a new TV show currently and will also be part as „Der Eisgeneral/the ice general“ in one of the biggest German pop musicals called „Tabaluga“.